Artist Signing with Gerald Mendez and Enrique Pita at the Sun Coast Plaza Mall in Costa Meza, CA on April 20 from 10am-1pm. Update 04/02/13 We added photos from Disney of the set. 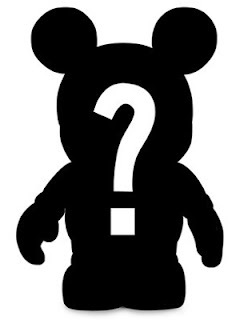 Update 04/01/13 We added photos from Vinylmation Exchange of the remaining 6 figures off the side of the tray. First of all, they used the Furry Friends/Whiskers Tales paws! 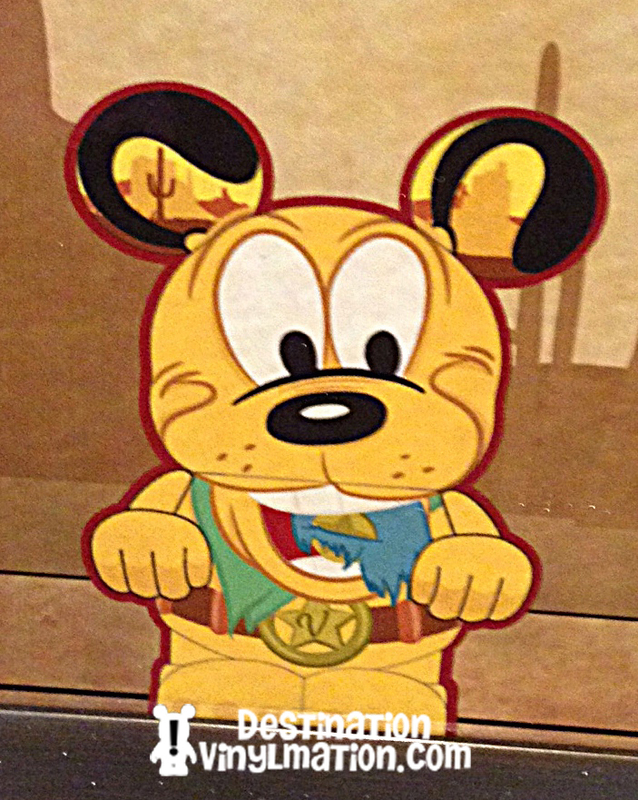 This may be my favorite Pluto. I love he just took a bite out of the bad guy’s pants. The “V” star belt is a wonderful touch. He is the sheriff. Disney Store makes the most amazing hats. The chewing on the wheat is a perfect touch. 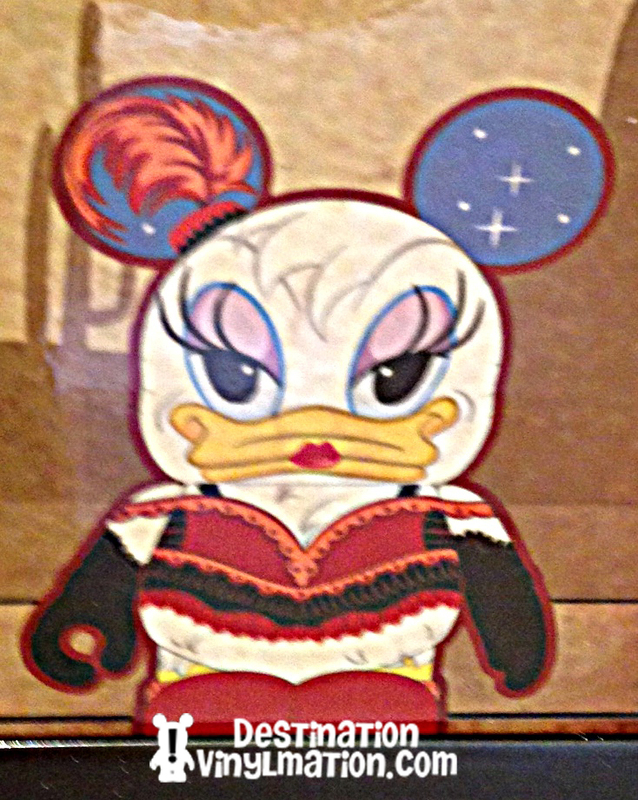 And I love that the artist used an old school Mickey. 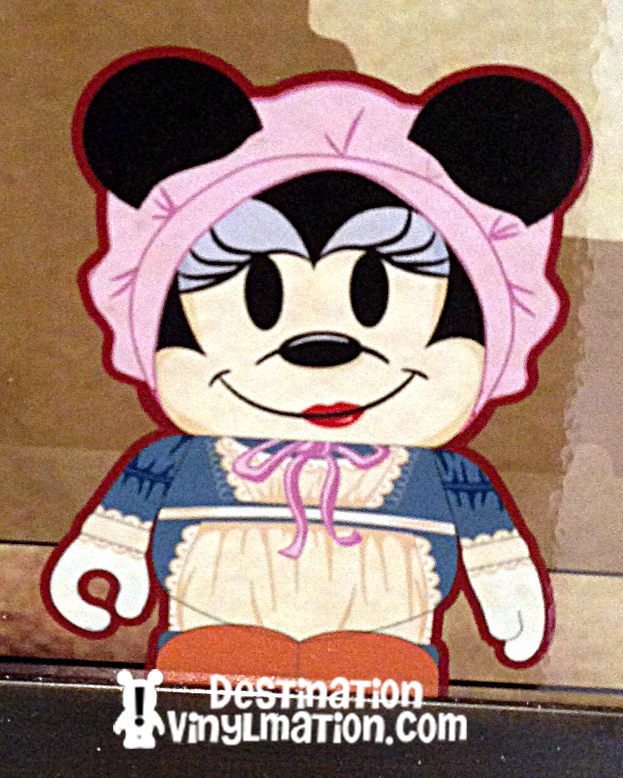 The bonnet is another great accessory by the Disney Store. She has the old school like, just like Mickey. Disney Store does the characters so well… some of the best mouse faces we have seen in Vinylmation. Donald as an Indian is just spectacular. The expression the DS artists give to his face in all his figures are the perfect way to draw him. It is very hard to make the duck bill work, but they always do. The feather head dress! What can I say? I can not wait to have this one in hand. Then, in the ears, you can see the wild west landscape with cactus and teepees. 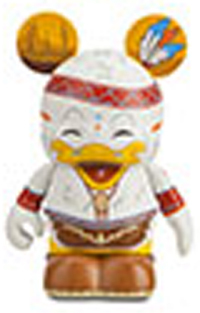 As much as I’m not a Daisy fan, the design here is a lot of fun. She looks like a performer in a wild west saloon. The clothing and feather in ear are great. Love the star background as well. 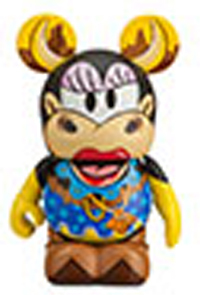 Great addition of a classic Disney cow into this western series. Another one with Furry Friends paws. 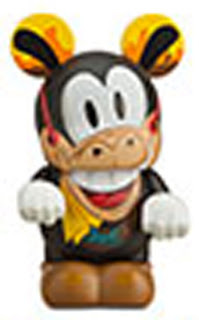 Great choice of the classic Disney horse into this set. 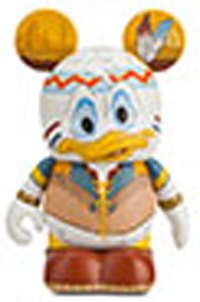 It’s about time we get Donald’s nephews into a set. Three 3″ figures here. Wonderfully themed as Indians to fit in with Donald. 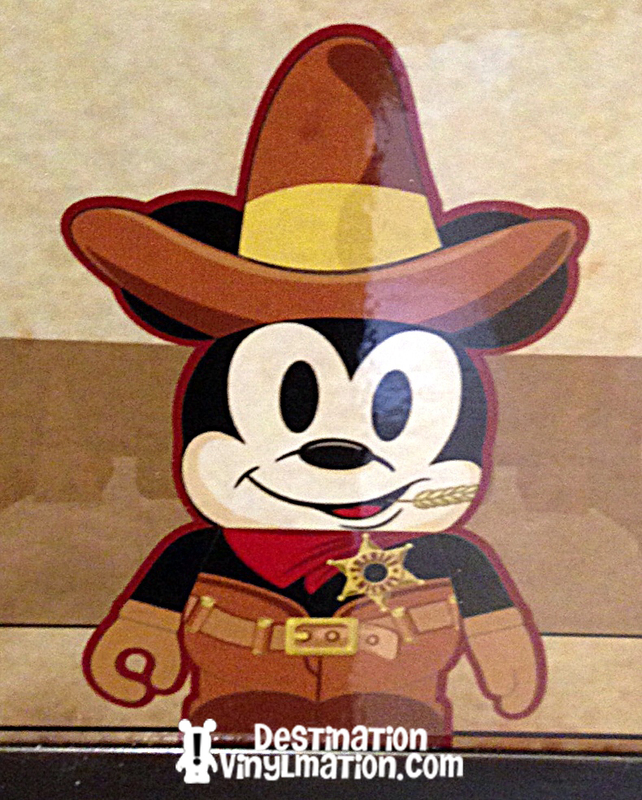 Looks like the Wild West series may be a smaller open window series similar to Disney Tunes. But a close look at the fine print mentions “purchase of a tray”, so I am not sure at this time. 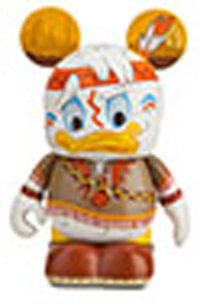 The series seems to be set for a Disney Store release on April 20th with an artist signing with Gerald Mendez and Enrique Pita from 10a-1pm at the South Coast Plaza Mall. We do expect the nation wide release over the same weekend. First use of paws outside of Whiskers & Tales/Furry Friends, interesting. Someone should take a closer pic of the figures and fine print. Looks like a good series! I’m so glad to see Disney Store artists were allowed to integrate Disney characters into a non-Disney type theme (unless they are designed after original Disneyland Old West theme) which would make this set even cooler. Maybe Ronald Reagan or Art Linkletter will be the chaser. 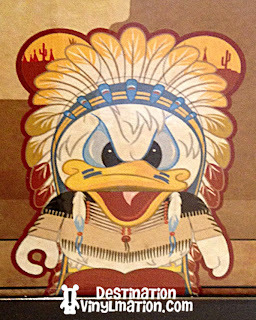 love donald and his head dress how awesome is that. 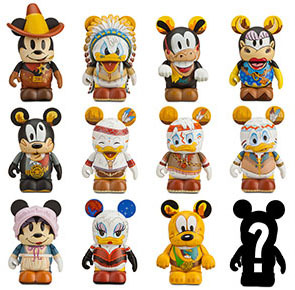 im pretty excited for this set now that it will be disney characters. My question is. 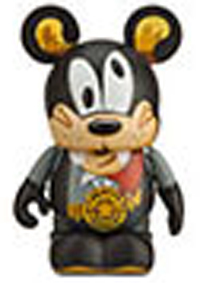 Since Pluto is on the FF mold, does this automatically mean we’ll have paint issues? Where’s Pete? 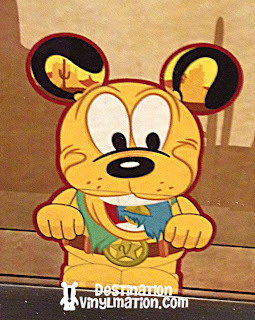 If Mickey is the sheriff, and Pluto has taken a bite out of “someone’s” backside, then where is outlaw Pete? I believe it’s an open window series. Anytime there’s a signing they put the black mystery chaser figure on the sign. 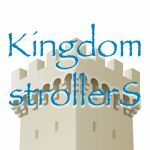 Can we stop with the Disney Store being “allowed” to do what they want? They have always had that right. 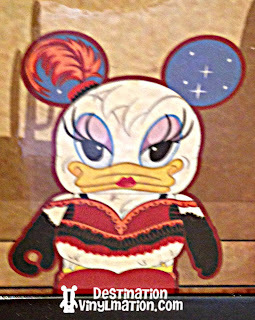 That’s why they made the Disney Store 25th Light Up Series and Furry Friends. They deserve the blame for unwanted crap like Extreme Wrestlers and they deserve credit for this series that looks pretty good! I think it would be awesome to have the chaser missing the fabric in their clothing due to Pluto.